By Shaunna Evans 56 Comments · This content may contain affiliate links. After reading on Pink and Green Mama about experimenting with homemade paint brushes, we have been exploring painting with all different sorts of tools this year. 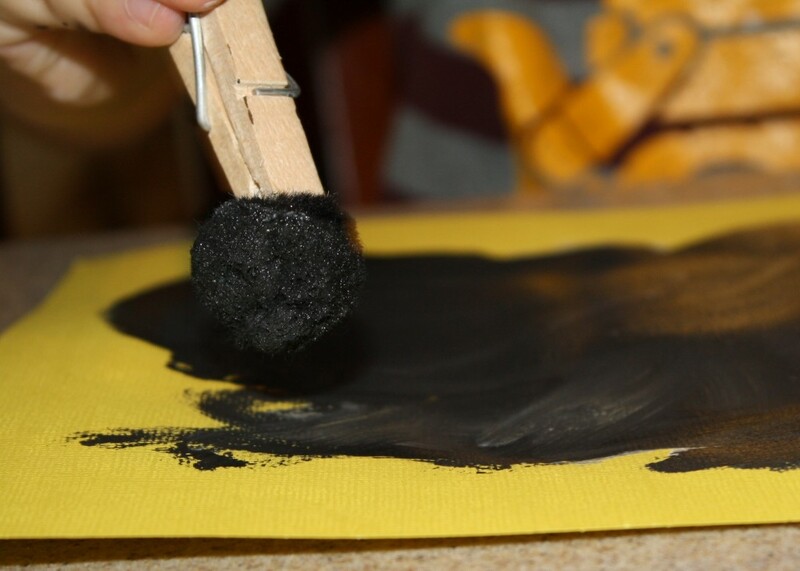 Recently we tried making our own paint brushes with pom poms, and they worked very well for us. Originally I was planning to paint with cotton balls. Then I saw the pom poms sitting right next to them and thought they would probably hold up better as the kids were painting. We were doing a black and white painting to go along with our P is for Panda theme, so we only used two colors. To set up the activity we pinched one-inch pom poms with clothespins. I matched the color to the paint color so the kids would have a little help remembering which pom pom went with which paint. This turned out to be a big help, and it would probably be even more helpful if we were using more colors. 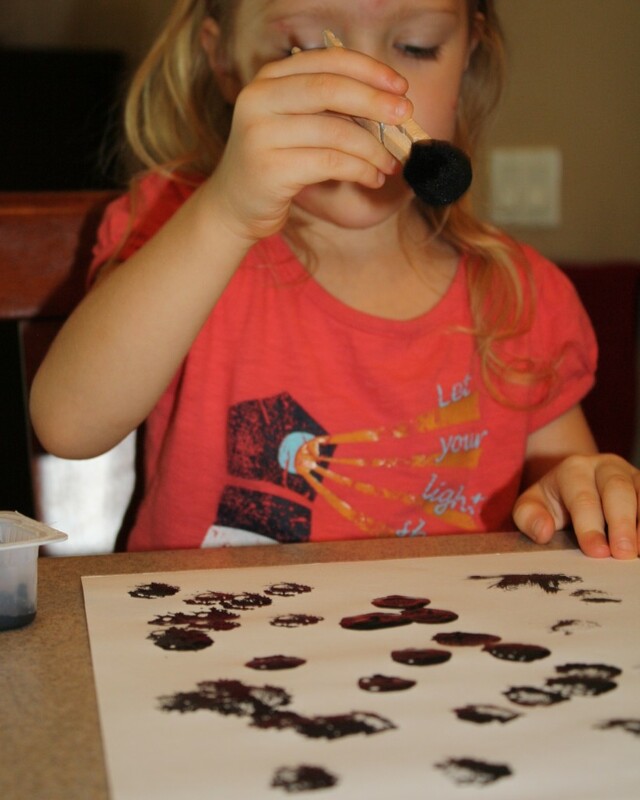 First the kids explored making dots with the pom pom paint brushes. I love that this was an activity my toddler and preschoolers could do together. You’ll notice that Tinker has a white pom pom and black paint. That’s because I wasn’t thinking when I set up her materials, and I switched the colors. She was quick to point this out! Each child made a couple of paintings. 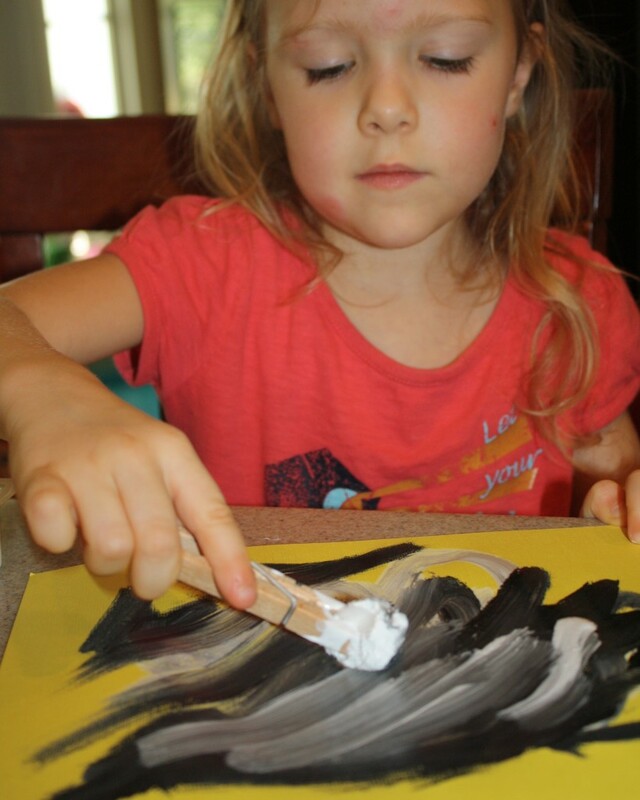 As they worked they experimented with using the pom pom paint brushes in different ways. The pom poms held a lot of paint. It wasn’t too much, just enough to make very vivid lines on their papers. I am looking forward to using this technique again with different colors and larger paper. After we finished our paintings I did a little research to see if anyone else was painting with pom poms, and I found this idea for using various size pom poms. That would be an interesting addition to the project. The kids could see the difference in the lines made by each size. Pom pom painting can be use for seasonal art projects too! 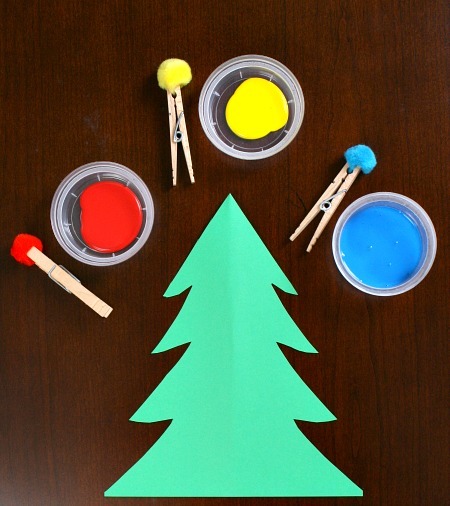 Use them to set up this Christmas tree art invitation. 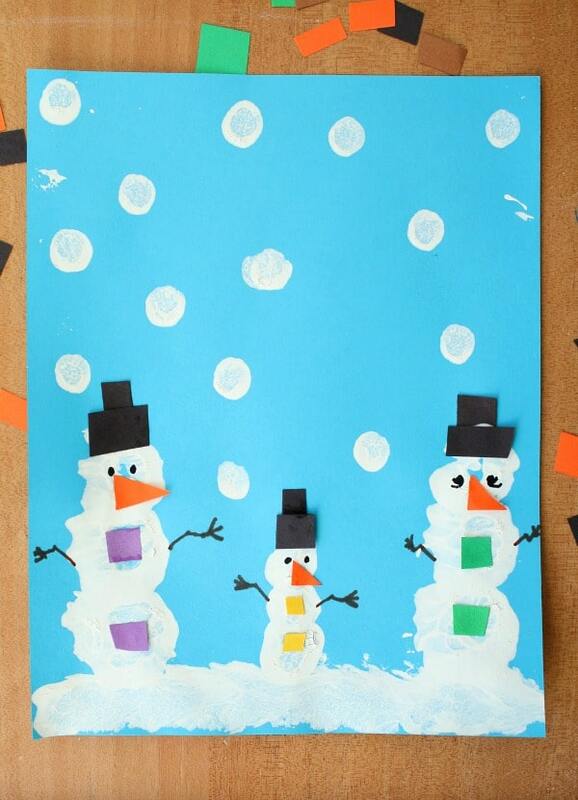 Or use them make some adorable winter snowmen art! In the summer create some ice cream cone art! GREAT IDEA!!!!! I will be doing this with my preschoolers!!!! Thanks, Kelly! I hope they enjoy it! We sure do. This looks like so much fun! Can’t wait to try it with my son! 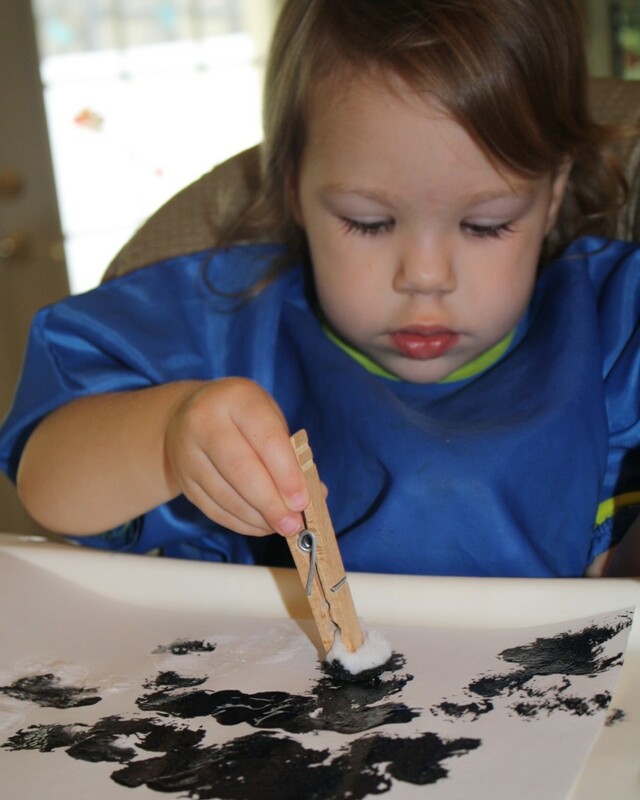 We’ve tried it with a few different painting activities now, and the kids continue to enjoy it. I hope your son does, too! I love the subtle way this incorporates fine motor strengthening, too. Thanks so much for sharing. I pinned this project a bit ago . . . love the simplicity of it, and the way it lets kids see that painting doesn’t have to be done just one way! 🙂 Thanks for sharing at Stress-Free Sunday. Hope your week is going well. We love to try out different ways to paint, and I agree…the simplicity of this terrific! Oh, I’m so glad this will work for you guys! I hope you enjoys trying it out. Shaunna – this is such a clever idea. I love that the clothespins are short and manageable compared to paintbrushes. Can’t wait to try this. Pinned! I am glad you like the idea. Thanks for pinning! Such a great idea! Thanks for sharing!! If you haven’t already, comment on our Share It Saturday Pinterest page and we can add you as a collaborator. You can start pinning any of your posts 🙂 The link will be on our blog post tomorrow. Hope to see you back at Share It Saturday! Thanks so much for featuring this post! I will definitely stop by tomorrow to share and check out the Pinterest page. What a great idea! I like the different ways they approached this. Dabbing with the paint and swirling it about. I like simple activities like this! I agree. I always like to see how the kids approach tasks differently. So simple but so versatile! My toddlers can explore, my preschoolers can make patterns and my school age children can pom pom out their names! Thanks for the great idea! I am so glad you can use this idea. 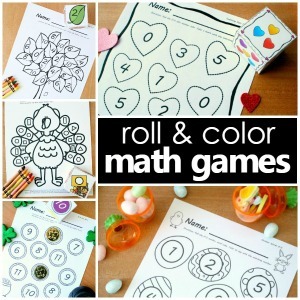 I understand the need for activities to be useful for different age groups, and I love that you can use it with your kids in so many ways. Enjoy! This is a wonderful idea! We will try this soon! Thanks for sharing with us at Share It Saturday! 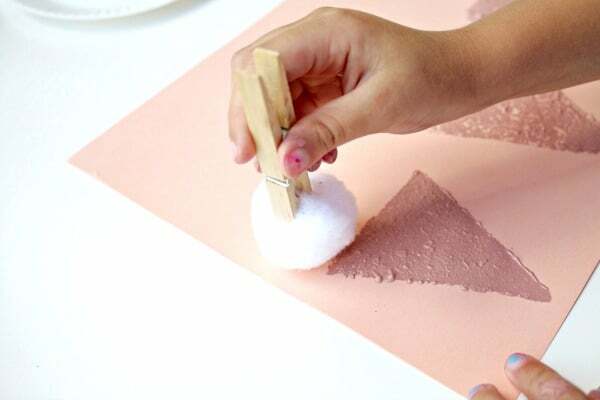 What a great idea to make your own paintbrush. Thanks for sharing this art idea for kids at Mom’s Library! Great idea! I love the novel use of materials you have on hand! Thanks! I tend to try to use what we already have on hand for a majority of our projects. What a great idea! 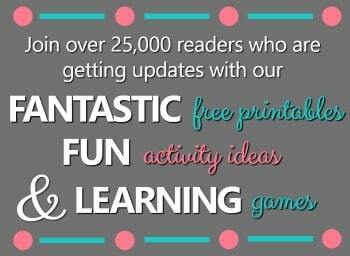 I would love you to come join my Pin Me Linky Party that just started a few minutes ago. I allow up to 3 links each week! This is clever. I love the clothes pin idea…that could translate to other items as well. I am stopping over from TGIF linky party. Thanks for sharing this. Thanks so much! There are definitely a lot of possibilities with clothes pins. I appreciate you stopping by. I just took a peak at your blog, and I love all of your craft activities. Following you on Facebook so I can see your newest stuff, too! oh what fun. great idea. i bet my oldest would love this. Fantastic idea ! My girls would love this. Can’t wait to try this one. Oh, I hope you do have a chance to try it out, and I hope they love it! What a great idea! I’ll use it with my kids for shure. Thanks. Thank you! I appreciate the invite. Thanks so much for linking up! Have a great weekend. Great idea, Shaunna! We will definitely have to try this. Thanks! I bet your son and his buddies will love it! How clever and fun. We have not experimented much with painting but since both my girls love to paint I think we should start. And this project has inspired me, what fun! Thanks so much for sharing on We Made That! Glad I could give you a little inspiration. I have some paint lovers here, too. They would be happy if we could paint every day. Oooh my little one would ADORE this. She loves anything to do with paint and the pom pom is a fun idea. Thanks! I hope you guys get a chance to try it out. I did this with my son when he was little, but need to have another go with my daughter! I love that it can be enjoyed by kids of different ages, so this might be a great time to try it again. I love the way you used pegs to get them to hold the pompoms – making the possibilities endless. This looks like fun, if my son would do it…but I suspect he would have issues giving up any of his “coal” to become paintbrushes! (http://play-trains.com/big-engine-train-pretend-play-on-a-big-scale/) Maybe cotton balls would work. 🙂 I understand his attachment. That’s a really fun pretend play setup. Let me know if you try cotton balls. I originally planned to use them, but I thought they might fall apart as the kids were painting. Just visiting from Tuesday Tots. I love finding new materials to paint with. We’ll have to try painting with pom poms as well! Thanks for visiting! 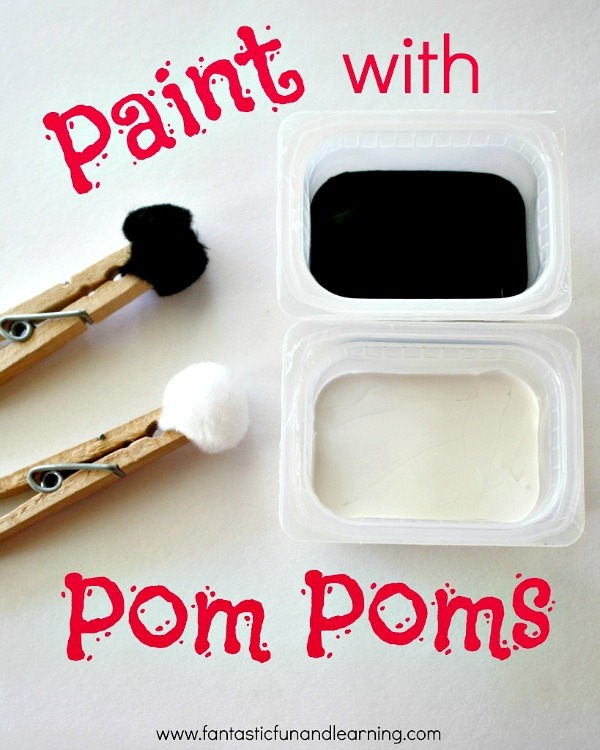 I hope your little ones enjoy painting with pom poms. What a great idea, and so easy! I think my little ones would love this! It was so easy! Your little ones would probably be at a great age to enjoy this technique. Mine definitely did.